Trilogy Communications global headquarters and manufacturing facility in Andover, England is fully accredited to ISO 9001:2015 standard, ensuring that our products and processes are rigorously assessed for quality – key to delivering the outstanding products our customers demand. You, the customer's, quality requirements. We do this while aiming to enhance our customers’ satisfaction, and to achieve continual improvement of our performance as we pursue these objectives. 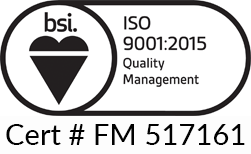 Our ISO 9001 registered processes include sales, marketing, design, development, production and technical support. All of our management processes, procedures and operations are carefully screened for complainace with the ISO 9001 standard by an independent accrediting body - BSI Management Systems. BSI Management Systems continue to conduct semi-annual audits of the quality and management systems in use at Trilogy Communications to ensure that the same rigorous standards are upheld for the benefit of our customers and our business.